I know, I know. I should have written this about a week ago so that you could get crackin’ on this simple, tasty, probiotic, and refreshing recipe in time for feasting this week. However, go ahead and try this one out as cranberries and pomegranates are in season! 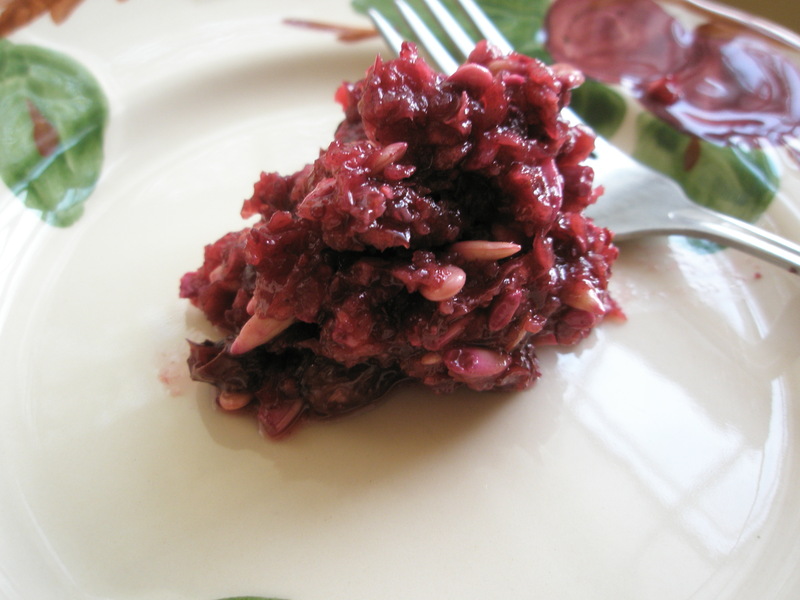 You can also try the recipe with just cranberries (pictured above). This will pair well with any pork, poultry or foul. FYI ~ if you haven’t seen this awesome clip on how to deseed a pomegranate (by a very enthusiastic man), I suggest you do. It’s such a breeze! Chop or use a food processor to chop cranberries. Add to your mixing bowl. Do the same to the nuts and add to mixing bowl. Stir in all other ingredients. Mix well. Place in a quart jar. Press ingredients down firmly. Screw on lid and let sit in a warm place for 3-5 days. Transfer to top shelf of fridge and serve when the meal is ready!